​ Everything we eat, everything we wear, all of our material possessions come from the Earth. 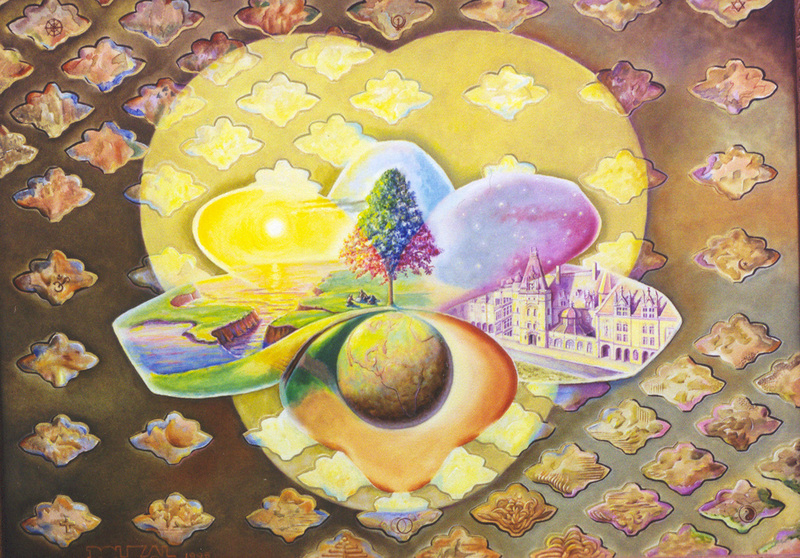 Enlarging upon this thought, “The Collective Consciousness” gives thanks to the Earth, the sun, the stars, air, water, life, and love - it is the awareness of the miracle of life and the acceptance of a wide range of cultural diversity shown in the miniature symbols encompassing the center of the painting. The petals and stamen of the lily provide seven parts needed to illustrate the spiritual unity of all beliefs. Due to the balanced warmth of the sun, the Earth is neither a frozen globe nor a fireball on which life could not exist. The gravitational powers of the sun and the stars keep the Earth on an orderly course through space. Without air, life could only exist for minutes; without water for only a few days. Life needs LIFE and life needs LOVE. We are all part of life around us and all connected to the "collective consciousness" shaping the future. Everyone is equally important - no one is larger than the other, no one stands in front making someone else less visible.